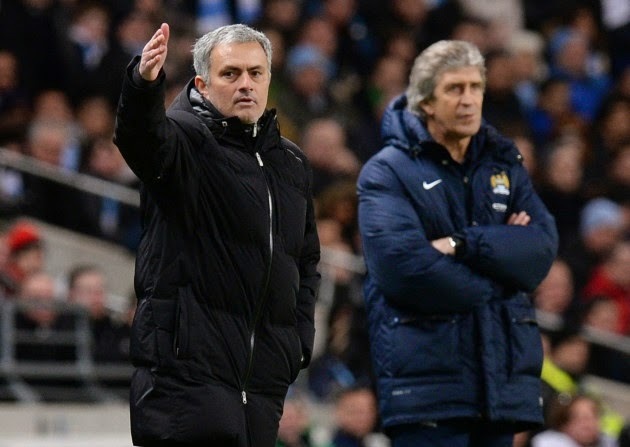 TITLE RACE: It's between Chelsea and Manchester City - Do you agree? It was interesting to see the reaction of Gary Neville and Jamie Carragher on SkySports's Monday Night Football last night. Both have stated that it's between Chelsea and Manchester City for the title. I was wondering if you agree? “I’m not writing Arsenal and Liverpool off on the first day of the season, but I’m not sure how they can win it. You look at champions and they have to fight when they have to fight. Chelsea have got a back four that’s massive and they’ve got Nemanja Matic and Diego Costa. Man City are the only side that can match them for size and power. They’ve got every single thing you look for. Can they counter-attack? Yes. Can they keep possession and control a game? Yes. Have they got dribblers? Yes. Have they got passers? Yes. Can they fight you? Yes. Are they good at set pieces? Yes. Have they got a good goalkeeper? Yes. They’re not going to concede a lot of goals, they are going to keep possession and they’re going to score a lot. I know it’s only early on, but there’s Ramires to come on, Mikel is to come on and Filipe Luis is to come on. They’ve got power and strength in depth and I think they are going to take some stopping. Of those two, definitely one of them is going to win the league, I think. In power, size and physicality I don’t see how the other teams can match them. “I don’t think we’re going off one game. It’s your experience of the past and teams that win titles have power and strength. Liverpool and Arsenal came close last year, especially Liverpool, but City eventually did it because of that power and strength. You think of Yaya Toure. The day Liverpool lost to Chelsea, Yaya Toure went to Crystal Palace, which had been a tough away day for teams since Tony Pulis came, and he just powered through. He takes it away from teams. That’s what Chelsea have got as well and Mourinho always likes that. Look at his last team – and now Costa is his Drogba and Matic is even bigger than Makelele. He has two big centre-backs in John Terry and Gary Cahill. You’ve got Filipe Luis coming in, you’ve got Ivanovic... there are four or five. I personally think that it's a long old season and you need a little bit of luck thrown in at times if you are going to win the Premier League. Whether that's having very little injuries and suspensions to your key players throughout the season, a couple of key decisions that go your way or just something that happens in a game that gives you the feeling that you are there or thereabouts. Chelsea are much better placed this season to mount a realistic challenge, so are City by looking at their squad and the signings they have made this summer. You cannot help but think that Arsenal and Liverpool look stronger in certain areas than last season but for me personally, Arsenal still look to be lacking in the middle of their defence, there is no natural leader or naturally defensive minded midfielder in the side and that could cost them dearly. As for Liverpool, how on earth do you replace Luis Suarez's goals and ability to conjure something out of nothing? Danny Sturridge can score as many goals as he wants but last season Liverpool had a three pronged attack and they simply do not have that anymore. I just look at Chelsea and City and see that every single position is covered and both teams have flair, pace, power and strength in their sides and most importantly of all, defensive minded midfielders and that's the difference between us and everyone else. I agree with Carragher and Neville. Do you?